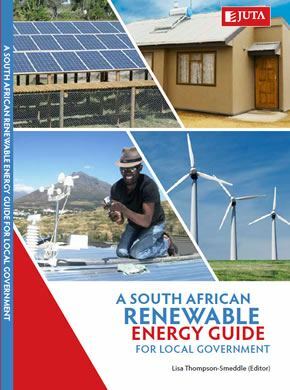 “A South African Renewable Energy Guide for Local Government, 2nd Edition.”(Thompson-Smeddle ed., 2015) was funded by the Hanns Seidel Foundation. The first edition was launched by Helen Zille in October 2012. This guide has been used to train government officials throughout South Africa. View promotional news clip on YouTube. Second edition books can be ordered Here. Since the publication of the first edition of the South African Renewable Energy Guide for Local Government, sustainable energy generation has become more cost effective, and in many instances renewables are now more economically viable than non-renewables. This narrowing gap in costs, coupled with an increased awareness of the environmental benefits of renewables, has greatly stimulated the sustainable energy market. Over the last several years, metropolitan municipalities have engaged with innovative, cost-effective sustainable energy projects and solutions. Medium and smaller municipalities are beginning to understand the roles and responsibilities of the various stakeholders in the energy sector. In line with these developments, this second edition provides useful information and solid examples of how politicians, city managers and government officials, in partnership with communities, can facilitate the adoption of renewable energy systems and technologies to achieve a more sustainable energy future for all. In South Africa, examples of sustainable human settlements, though promoted by government policies, are few and far between. This is primarily due to the continued predominance of old approaches to township planning, infrastructure and housing design, and a lack of cross-sector integration and collaboration. With the backdrop of definitions listed in Chapter 1, how would one define sustainable housing? In terms of green building, we need to reframe the question to: how much does it cost your city not to have a green building policy. We’ve embarked on the beginning of the last days of the age of oil. Embrace the future and recognize the growing demand for a wide range of fuels or ignore reality and slowly—but surely—be left behind. The earth is a closed system for matter – nothing disappears. In nature, the cycle of life operates in a circular system and waste generated by one organism becomes food for another. One possible measure of the overall (un)sustainability of an urban transport system is the vehicle kilometres travelled (VKT) within the functional area of the relevant city to support its routine daily activities. Urban Agriculture (UA) can be defi ned as an industry located within (intra-urban) or on the fringe (periurban) of a town, a city or a metropolis, which grows and raises, processes and distributes, a diversity of food and non-food products. A socioecological approach to sustainable neighbourhoods embeds all human activity within the eco-system of which it is part, recognising its limits and constraints. There is now an emerging global consensus that unsustainable resource use (global warming, breakdown of eco-system services, depletion of key renewable and non-renewable resources) will threaten the existence of large numbers of human and non-human species. In South Africa we have a plethora of good legislation and policies which govern urban planning, housing, energy, water, sanitation, solid waste, transport and other aspects of settlements.